I started drawing at an early age. My brother and I spent many hours drawing super heroes, he the Marvel and me the DC characters. I pretty much never stopped. Those comic books that I bought at the corner newsstand in our Brooklyn neighbourhood stayed with me all these years, both via inspiration and physically as I still have most of them. The work of George Peréz, Neal Adams, Bill Sienkiewicz, Jim Aparo and others greatly influenced me. As I grew older the Planet of The Apes films were a huge source of wonder. The Gorillas scared the hell out of me. The chimps, who were more compassionate, in particular Cornelius, were very moving to me. They were almost as much prisoners on the planet as the humans were….My chimps don’t tend to look much like those or the real thing I suppose, but I know there’s a bit of Cornelius in all of them. My art went from sketches and illustrations to digital paintings over the course of many years. Around the time of the birth of my second daughter I saw a few Tiki paintings that were shared on Twitter and had my first visit to the amazing Mai Kai Restaurant here in Ft. Lauderdale. Inspired, I sat at lunch one day and began a sketch. Several digital illustrations followed and they began to get more complex and soon I was producing highly detailed digital paintings. These always started with a sketch on paper which I then scanned and brought into Photoshop and painted. Around this time I became a member of the Tiki Central forum and was exposed to many great artists, carvers and mug makers. One in particular, Brad Parker, urged me to try painting. Around that same time I had a few artists friends also pushing me in that direction. I bought some acrylics and brushes and produced my first painting, GATHERING STORM, on a piece of pine. From then on I began to explore acrylics, primarily in the Tiki art genre, then later Pulp art. The Tiki community on Tiki Central as well as those that come to Hukilau, have been very supportive of my work. The Tiki Artists also serve as great inspiration. Brad Parker along with Doug Horne, Thor, Sam Gambino, Ken Ruzic and many others are each so distinctive and talented, they’re a wealth of inspiration. From that point on I’ve only really worked in acrylic. As with the digital works, I begin with a pencil or pen sketch on paper. Usually my sketchbooks but often times just copier paper or any that is handy. I tend to get a mental visual pretty quickly and lock in that image. The pencil sketch is rarely very detailed or finished. I then redraw that idea onto my canvas, usually wood or wood panel but sometimes canvas. I’ve also done a number of paintings on cigar boxes. The drawing on the canvas is usually just as loose as the original sketch. Even though I have the image or the idea of the image in my mind, I tend to improvise to a large degree as I paint. There have been very few exceptions to this. The most prominent one that comes to mind is my painting KOSHI GREETS THE STORM. I produced a sketch of a chimp sitting atop a Marquesan styled Tiki in the middle of a hurricane. 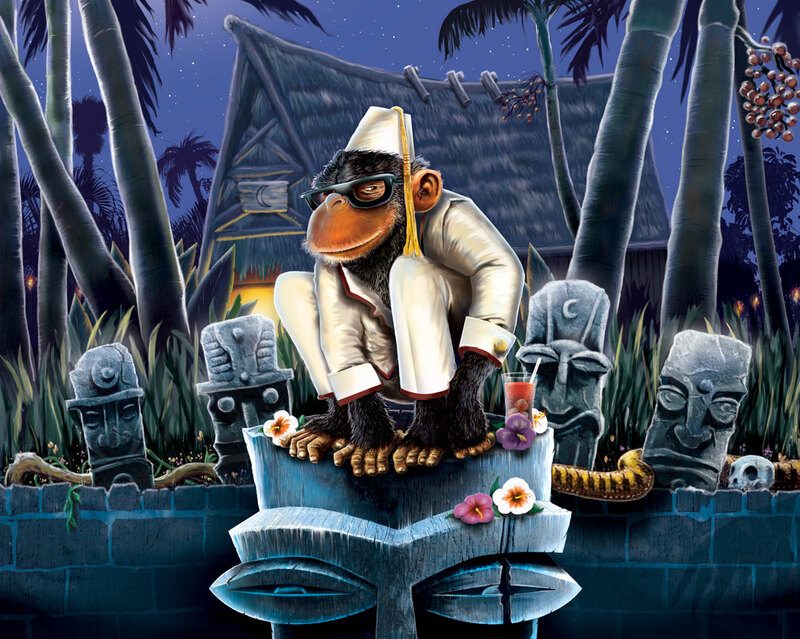 I thought the sketch was so well balanced and the chimps weight on the Tiki so exactly as I envisioned it, that I was afraid I’d lose that in the painting. So in this case I did project the image onto my canvas and retraced the drawing. I use a variety of brands of Acrylics, from Basics to Golden. The brushes I buy tend to be bargain brushes. I do a lot of dry brushing and that will always tear up your brushes in short time so I feel expensive brushes are a waste of money. The only exception to this would be when I purchase a nice thin, long brush, usually a 00. This is essential to me for rendering the multitude of hairs on my chimps! I’ve recently taken up sculpting. I’ve done a few in Super Sculpey which you can bake right in your own oven and am currently working with Roma Plastalina to make my first Tiki mug. I find this medium challenging and a lot more fun than I could have imagined. In choosing subject matter, I tend to go with things that stem from my childhood or remind me of it. I love pulp art, Tikis, science fiction, and all that permeates my work. I’ve taken to combining Tiki and Pulp and have produced some work that I think nicely incorporates both, in particular my Doc Savage painting THE TIKI GOES NOWHERE! I’ve noticed that working on my own ideas, without deadline or the pressure of someone looking over my shoulder, and just for the fun of it always brings out the best in me and in turn the best reaction to my work. So when done with a painting I look through my sketches and the one that seems the most fun is the one that is next.